Our barge pounds 6 7/8" O.C. 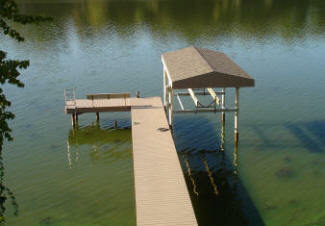 steel pilings to support your dock. Caps & I-beams are welded to the pilings. Joists are bolted to the I-beams for strength. Decking is fastened by screws, not nails. *not used with treated lumber decking. Many Accessories are available -- benches, bumpers, cleats, & much more. We also pound Wood Pilings --- Call or EMAIL for more information. Our barge pounds 6 7/8" O.C. 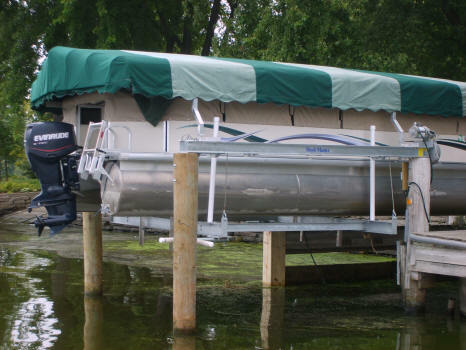 steel pilings to support your lift. Lift capacities from 4,500 to 30,000 pounds. Includes standard full lenth carpeted bunks & PVC pipe guides. Many Accessories are available -- removable canopy, shingled roof, piling guides, bow stop, catwalks, etc.